My thoughts on “Sugomi-chan”, the debut solo single from former MIGMA SHELTER member Yoneko. I must admit that while I know who MIGMA SHELTER are and could probably even name a few of their songs if you asked me to, they were never really a group that I followed particularly closely. I’m more of a Yanakoto Sotto Mute guy if we’re talking AQBI projects, if anyone was wondering. Of course MIGMA SHELTER have had some well documented problems lately, what with losing pretty much their whole line-up and currently existing as a duo. Hopefully they can get things back on track in 2019 as I know they have a lot of fans in the West. I’m not reviewing a MIGMA SHELTER release today though, but I did have to mention them to give a bit of backstory as to how we got here in the first place. 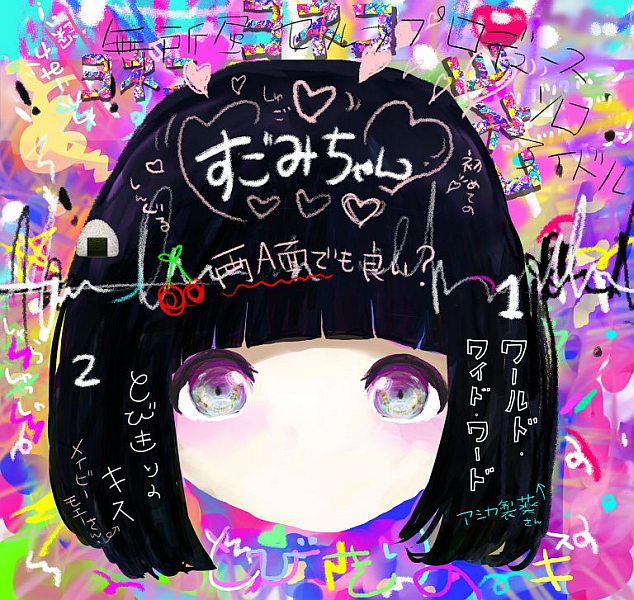 This week I will be reviewing former MIGMA SHELTER leader Yoneko’s debut solo single “Sugomi-chan”. She left the group to pursue a career in voice acting but it seems like she’s still interesting in making music and honestly, she has been performing a lot more than she’s been getting voice acting gigs as best I can tell. I’m sure that makes fans of her singing happy but I do wonder if there’s any personal regrets there. As far as this single goes, I’m honestly not sure what I’m expecting. I haven’t listened to it before starting this review so I’m definitely coming in blind. I know Yoneko has her pretty out there moments so things might get a bit weird, or maybe not. The cover certainly looks like it could be for some kind of Denpa or candy-coated Pop tune so that’s kind of what I’m feeling as I judge this book solely on its cover. Am I right though, I suppose I should hit play on this CD (it’s actually in iTunes) and find out one way or the other shouldn’t I? Opening track “World Wide Word” not only has some nice alliteration (and debatable use of English) in its title but it also has a rather pleasant opening instrumental. I’m no genre expert as we all know by now, but I feel confident in saying that I enjoyed the earnest energy that the Jazz tinged Pop arrangement provided. Some of that energy does fade a bit as the song gets going but they brought the bass guitar into the song a lot more which was an unexpected but rather interesting choice. I feel like that particular component is usually pushed way to the back and forgotten about for the most part on a lot of songs so it was cool to hear it more on this song. It all sits somewhere between Indie Pop hit and children’s cartoon theme song for me, which is a pretty wide range I’ll admit. Yoneko’s vocals drift along with the instrumental as it does its thing, at times showing flashes of something more energetic, specifically where the chorus is involved. For the most part she finds a pretty comfortable gear and coast along in a carefree manner which I think suits the instrumental rather well. There is a certain childish element to the song, coming mainly from the vocals which are hammed up for effect but also contain enough of Yoneko’s real voice so as not to be eyeroll worthy. I’m not totally sure that this is my thing but the song has grown on me the more I’ve listened to it while putting this review together. Only one b-side is included in this single, which doesn’t seem like much seeing as we’ve been spoiled by getting 2 or even 3 on most singles for all these years. “Tobikiri no Kiss” marches to a slightly different beat than “World Wide Word” although there are quite a few similar elements incorporated across the two songs. We still get a healthy does of wistful, floaty vocals but there is much more emphasis on Yoneko’s natural singing voice in this song. That’s something I’m super okay with as I personally think she has quite a nice singing voice, especially when it comes to what she can produce with her lower register. That being said, I’m not so sure I’m as big of a fan of this song’s chorus, it’s not particularly bad but it just felt a little flat. That’s probably just due to this style of song but yeah, I would have liked to have heard a bit more than what they gave us. Instrumentally this song is a pretty inoffensive Synth-Pop type deal, opting for bright melodies, sparkle effects and light drumbeats. It’s a very pleasant listen, though it’s something that I would personally have to be in the right mood for. I feel like they could have done more with it but if the intention was to make the vocals the focus then the instrumental they chose serves its purpose very well. I have to be honest, I was expecting something a bit more eccentric out of Yoneko here. That might have been a bit misguided of me though so I’m not going to hold it against her too much. This single is still a really nice listen and I feel like if you’re into the more cutesy Pop side of Idol music then there’s maybe something here for you to check out. It’s unlikely to win you over if you like your Idol music with a bit more bite though. I do hope we get another single or two from Yoneko in 2019. While this one wasn’t really for me I definitely think she has a wide range of influences to draw from so who knows what she could come up with next. She’s been doing a few collaborations lately that have been sounding pretty cool (like her one with FEATURES) so I’m definitely looking forward to whatever she puts her name to next.